Both mum and I not only have our birthdays in March but also in the same week. I am 16 this year, Alhamdulillah, and my family members had given me wonderful presents. Mum gave me a lot of her Australian, American, Canadian and New Zealand stamps wrapped in a lovely silver coloured box. My dad bought me stamps at the stamp fair and an A3 sized document file which I now use to keep my stamps in. My sister Aeshah gave me some Vietnamese stamps featuring dolphins that are missing from my collection and lots of odds and ends that I could use for my craftworks. Anisah gave me a number of her drawings and Ali gave me a hairdryer, a ‘Snoopy’ clock and a watch. My parents gave me a beautiful birthday card with a picture of a flower drawn by mum (the artist), using soft pastels. Ahmad Ali gave me three birthday cards for he enjoyed card making so much that he couldn’t stop making them… Abang Muhammad sent me a birthday card too, all the way from Chicago together with lots of gorgeous U.S.S.R. stamps. My mother had a marvellous birthday too. Again, most of her presents were stamps from all of us. I secretly looked through her stamp albums and picked out stamps that I own but is missing from her collection. I’m delighted that she was thrilled to receive the stamps that I gave her. I also gave her some Machin stamps (the British definitive stamps with a picture of Queen Elizabeth’s head – mum simply love them, she has a few pages of those lovely stamps in her stamp album and wishes to own as much as she could). Aeshah gave her stamps too. Anisah gave her an envelope with a picture of a cat that she ‘bought’ for 6 stars (our play-money currency) from my little brother. And Ahmad Ali gave mum a beautiful egg cup and a special Machin stamp(the 1840 Anniversary Machins) with pictures of both Queen Elizabeth as in other Machin stamps and Queen Victoria as in Penny Black. That night,we had pizzas from Domino’s Pizza for our dinner. Everyone love Domino’s Pizza and we celebrated most of our birthdays with them. It was only last month when we had pizza for my little brother’s birthday! I had been introduced to stamp collecting since I was a little girl. Both of my parents collect stamps and they both have beautiful collections of stamps from most parts of the world. However, it wasn’t until I was 10 when I started to have a real interest in stamp collecting. I was reading an article from a magazine at my school library about a girl who had collected more than a thousand stamps by the age of 8. When I went back home, I took out my dad’s stamp albums and look at the arrays of stamps neatly arranged inside them. For the first time, I was fascinated by stamp collecting and decided to start my own. My first few stamps were given to me by my Indonesian classmate who received letters from her families and relatives in Indonesia. Unfortunately due to my carelessness, I lost them all and I really regretted it. Nevertheless, it was my parents who helped me a lot in stamp collecting. My father bought me a stamp album two years after I started collecting stamps; it was when he thought that I was already serious with my hobby. He also gave me stamps from his letters. My mother however, gave me lots of stamps from her own collection and some dated back to her schooldays. She told me how people threw away most used stamps that were very common during those days. Had she kept them, she could have sold them now for a good price. I guess that is the reason why I have more than a page filled with ‘Alophoixus ochraceus‘ (Merbah Beringin) stamps in my stamp album. If you live in Malaysia, it is impossible to miss the stamps since they appear on almost every letter sent by the Malaysian Postal Service or Pos Malaysia. My good friend, Aishah Salihue (whose parents are from Sri Lanka but is living in the USA), mailed me US and Sri Lankan stamps every now and then. Even her wonderful grandfather gave me lovely Sri Lankan stamps when we met at Aishah’s house in San Jose in 2006. A day with Aishah in the backyard of her house in San Jose. From left: My sister, Aeshah; Aishah; me; Aishah's brother, Ali; and Anisah (far right) in a pink sweater. 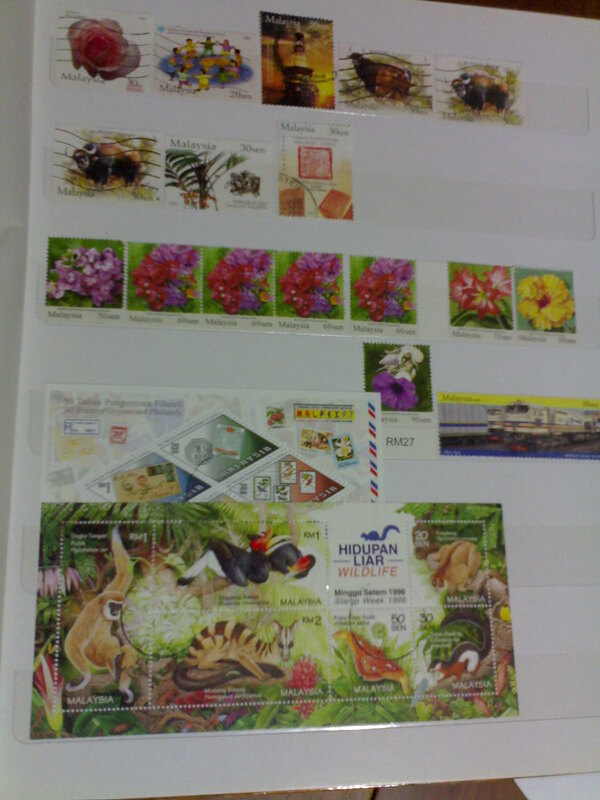 My collection consists mainly of Malaysian stamps especially the ‘Birds of Malaysia’ series and the ‘Malaysian Agro-Based Definitive Stamp’ series. Although I haven’t collected the entire set of both series, I hope to be able to collect a complete set of the mint stamps and a complete set of used stamps from both series. 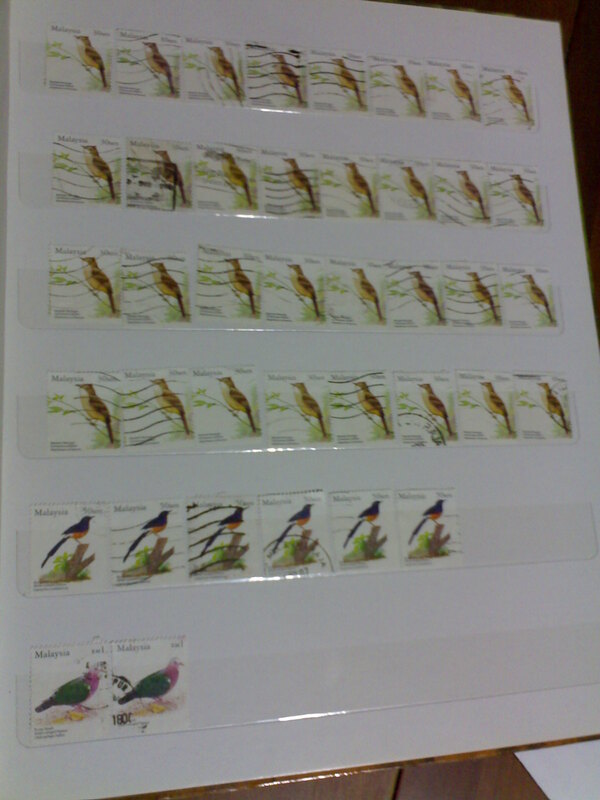 Some of my stamps from the 'Birds of Malaysia' series. I have more than a page of these. Many wonderful things happened on our birthdays and my brother, Ahmad Ali, told me that his 8th birthday was his best. Ahmad turned 8 only six days ago and many wonderful things happened on his special day. Coincidentally, he also started his silat (Malay martial art) class on his birthday. He had been waiting for years for the day when he could join my sisters and I to our silat class. He amazed our instructor by being able to do a lot of the simple moves (since Ahmad had been ‘practicing’ with his sisters at home). Back at home, dad brought him an envelope addressed to him from Abang Muhammad (the letter actually arrived the day before but our mail-girl, Anisah, had forgotten to pick up the Saturday’s mail). 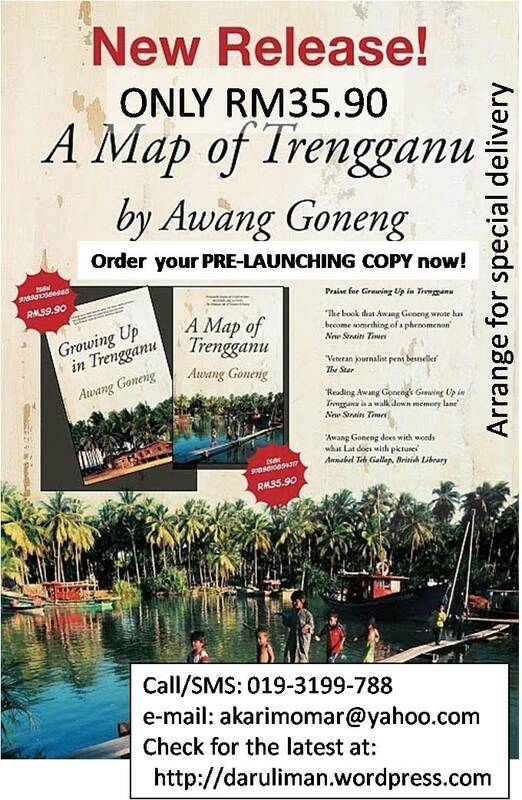 When he read the sender’s name and address, Ahmad didn’t believe that it was from Abang Muhammad. He insisted that my dad was teasing him until he opened the birthday card and saw Abang Muhammad’s signature. He was speechless with pleasure and surprise at the thought of Abang Muhammad sending him a birthday gift all the way from Chicago. Ahmad was also delighted with the mint stamps that Abang Muhammad sent him. Unwrapping gifts had always been the main part of our birthday celebrations. It was fun to look at him shaking his presents and peeking into the openings of the wrappers as he tried to guess what was inside and whom it was from. It is also very rewarding to look at his facial expression when he opened his gifts. His joy and delight was painted all over his face. Amazingly, his best birthday present was a pack of menthol flavoured sunflower seeds from mum, followed up by a DIY model airplane (from me) and a﻿ ‘Maisto‘ Assembly Line Enzo Ferrari from my dad which tied in 2nd place. A stamp album from my mum with 132 stamps inside for him to start his stamp collection was chosen as Ahmad’s 3rd best birthday present followed by the mint stamps from Abang Muhammad. However, Abang Muhammad was very lucky because Ahmad chose Abang Muhammad’s card as his best. He had a beautiful birthday e-card with a cute teddy bear from Aunty Selina who lives in Maryland, USA. That night, we had pizza from Domino’s Pizza for his birthday dinner. And Ahmad (who had been a fussy eater) finished 3 enormous slices of the extra large sized pizza! Note: For more photos, click here. Last Friday, my family and I went to May Tower Hotel in Jalan Munshi Abdullah to meet Uncle Zahedi, Aunty Suzana and Brother Hisham. They came from Sri Lanka to send Brother Hisham who is currently doing his Master’s Degree in Islamic Finance here in Kuala Lumpur. We met them after the Friday prayers. When we reached there, Aunty Suzana looked at me exclaiming, “Oh, she looks just like Aishah”. Aishah Salihue is Aunty Suzana’s niece and a friend of mine who lives in San Jose, California. Coincidentally, Aishah shared the same name with my little sister, Aeshah, while Aishah’s little brother shared the same name with my little brother, Ali. I had met her and her family twice during my visits to the USA in 2005 and 2006. I remember going to her house in 2006. Her huge backyard is like a wonderland filled with many kinds of fruit trees. On the day I visited her, Aishah found out that their first apple had ripened in the backyard. She excitedly pluck it and ran with the apple indoors to show it to her mum. 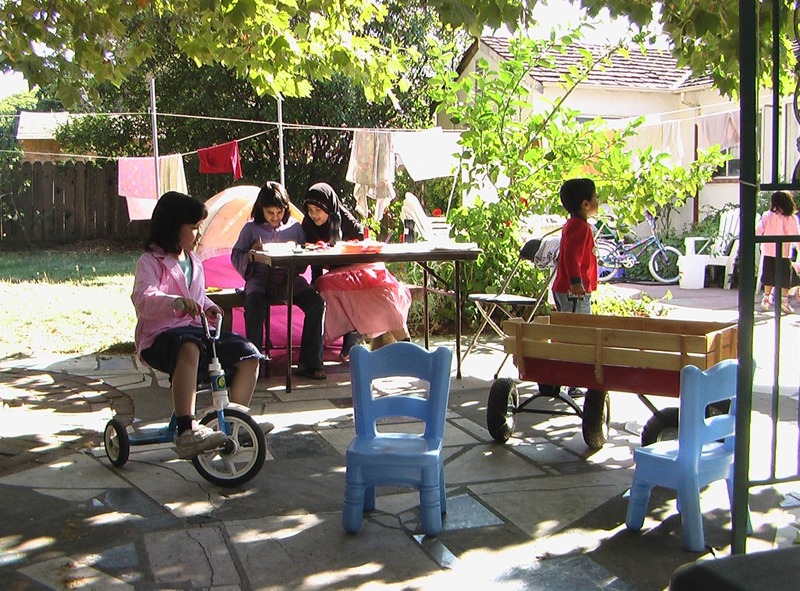 There was also a tent, Aishah’s bike, his little brother, Ali’s wagon, a table with benches and a trampoline in the backyard. I remember feeling so excited as I succeeded to ride Aishah’s bike without any difficulties even on the grass. It was actually my second time riding a bike without the two tiny side wheels to help me balance. I also remember pulling Ali’s wagon with both ‘Alis’ giggling inside. We also drew pictures and wrote stories on the wooden table. But the best part of the day was when I met Aishah’s grandparents who came all the way from Sri Lanka. Aishah’s grandfather gave me a lot of very beautiful Sri Lankan stamps which are now safely kept inside my stamp album. We had a great time. Before we left, Aishah’s mother gave me a beautiful brown hijab. We still keep in touch through emails and we sent stamps to each other several times. I really hope that Insya Allah, I could once again visit Aishah in her wonderful backyard. It was so enjoyable meeting Uncle Zahedi, Aunty Suzana and Brother Hisham. They are very nice and wonderful to be with. Aunty Suzana is very sweet, beautiful and friendly and she really reminds me of her younger sister who is Aishah’s mother. My busy Sunday started with a trip to the market. There weren’t many people at the market as it was school holidays. Even some sellers were not there too. Later, we went to another market called ‘Pasar Pagi UO’ (UO Supermarket’s Morning Market). We bought 14 IKAN KELI (catfish)! I just love catfish and so does my sister. Mum used to buy 10 but it wasn’t enough. After our Zuhr prayers we went out in beautiful clothes to two ‘Kenduri Kahwin’ (wedding receptions). The first was near the Taman Greenwood where my dearest Jiddah would wait for her bus everytime she went back to Kuala Terengganu. The food there was quite good. The second wedding reception was held at a mosque near Taman Melati. The food there was even better and I just love their lamb. We went back home to perform our Asr prayers and went out again. This time dad drove us to visit a stamp exhibition. It was just a small one but we saw all kinds of beautiful stamps. Each of us got our chance to choose some stamps for ourselves and mum paid them. She also bought lots of lovely flower stamps as my birthday present and some cars and locomotive stamps as Ali’s birthday present. I had been collecting stamps since a few years ago; after admiring mum and dad’s stamp collections. Anyway I only have a small collection. So I am always very excited to be able to add more stamps to my collection. At about 5pm, my parent’s good friend Uncle Khairul and his wife Aunty Shida came to our house together with Aunty Intan and Uncle Bad. After performing our Mahrib prayers, we took them to Pak Ya’s Corner for dinner.They really enjoyed their food. After dinner, we went back to my house. Uncle Khairul, Uncle Bad, mum and dad were discussing something while Auntie Shida and Auntie Intan watched the television series ‘Merlin’ with me and my siblings. We all had a great time and they went home at about 10:30pm. It was indeed a very busy day but it was really fun.